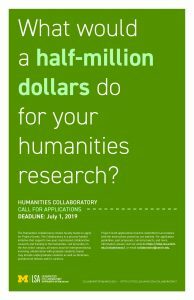 Funding applications for one to two-year collaborative research projects are due on July 1, 2019 at midnight. Late applications are not accepted. Decisions will be communicated by August 1, 2019. Project funding applications require sign-off support from the PI’s appointing unit(s) Chair/Director. This page will be updated in March, 2020 for the 2020 funding cycle. Each project is required to publicly disseminate results of their projects towards the end of year two or, at most, six months following the end of the grant period. Some teams may choose the route of an exhibition or display, others programming, perhaps a performance, or film/documentary or teach a MOOG. Other ideas include presentation of the work on a digital platform, gaming, community engagement, editorials, engagement with K-12 educators, virtual reality, etc. Funded teams will be required to present an “in-progress” discussion and/report of their project each year of funding support. The presentation/report should consist of goals, plans, what has been accomplished to date, what has worked, what hasn’t worked, and the collaborative process. 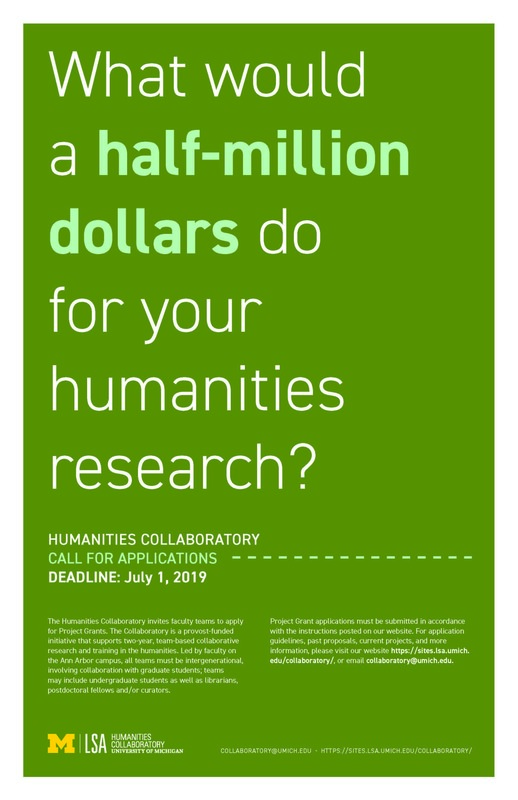 The discussion is aimed at those who are interested in the research project itself and/or collaboration in humanities research, especially those who may be contemplating applying for funding at some point in the future. If requested, all team members will also be required to attend any workshop, program or meeting organized by the Collaboratory (no more than 4 in total per year). We suggest you use Word to write the narrative (questions 2 – 8) and ensure the word count is correct and then save as a PDF. The Project Application Cover is required to be completed and includes space for the project title, abstract, other information requested in question #1, and a section for sign-off support of the PI’s involvement in the project (due to the annual course release). If there are different PIs in Years 1 and 2 indicate the names next to each other on the PI line and the signers sign next to each other on the signatory lines. The Budget Worksheet is required as well as a short CV for each faculty member involved in the project. It would be most appreciated if the two forms, the narrative and the CV’s were combined together in to one PDF submission (application cover, narrative, budget worksheet, CV’s). 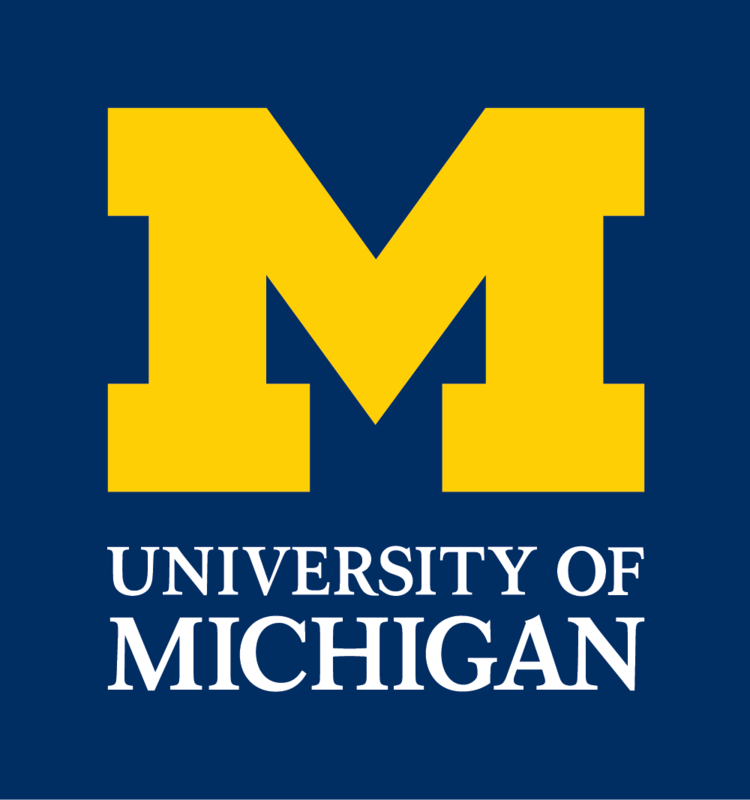 The proposal with the cover and budget must be submitted in ONE email to collaboratory@umich.edu by July 1, 2019 at midnight. Late applications will not be accepted. Reviewers will be interested not only in the value of your project, but especially in what collaboration adds to your project. The bullet points below each question reflect the kind of information the reviewers will be looking for and are meant to serve as a guide for answering the questions. Because the review is conducted by a broad, interdisciplinary committee, please ensure that your language use is clear to those who may not be familiar with the field. Provide a project title and 250 word abstract of the project. 1. Identify the research team (on cover sheet/form). What original contribution(s) will the project make to the humanities field(s) in which it intervenes? Please account for its relationship to earlier or existing projects, both individual and collaborative. What original contribution(s) does your project make to the humanities broadly conceived? In other words, how does the project advance the role of the humanities in the academy and in the world? What is your team’s vision of collaboration? Why is collaborative research appropriate for and necessary to the project? What does the collaborative/team-based/intergenerational model allow you to accomplish that can’t be accomplished otherwise? What collaborative research methods will your project employ (e.g. research together on-site, research trips, collaborative learning, etc.). How will the collaboration work, on a weekly and monthly basis? What collaborative relationships do you anticipate will emerge? What issues might arise in working collaboratively? Diversity is known to increase creativity and to enrich research results. Describe the diverse perspectives represented by each member of your research team (including students, at least for the first year) and what scholarly expertise each team member contributes to your project. Describe the roles of undergraduate students, if relevant. What skills will the students learn? What will they contribute to the project and what responsibilities will they have? What will your collaboration produce? Describe the collaborative nature of the project outcomes (e.g. collaborative writing, collaborative production of a performance, curricular collaboration, etc…). How do you plan to communicate the results of your research and to what audiences? We are particularly interested in innovative approaches to scholarly communication and in plans to address the wider public. What platforms will you use to communicate your results and why? What technological support will you require and where will you get it? What are your ideas for using the dissemination funding available at the end of the grant period? **Grant recipients will be asked to submit a dissemination plan and budget request for these funds at the end of the first year of the project. It is anticipated that ideas included in this application will be provisional. The PI is expected to serve as project manager—that is, to organize the group’s work, convene research group meetings, supervise student mentoring, and track budgets. Do you anticipate other project management responsibilities to be shared by team members? Please explain. Please describe specific plans for mentoring graduate students (and undergraduates, if relevant). How will you know if you are mentoring effectively? What are your plans for data management, the preservation of digital assets and materials, or the storage of archives? How do you plan to evaluate your project, and at what stages? How will you know if your project is successful? 8. Please provide a timeline for your project. 9. Please complete the Project Grant Budget Worksheet for your project. 20% effort for PI per year (one course release per year which cannot be banked; must be in winter term for year 1). For PI’s with a joint appointment, please indicate the unit for which the course release will be taken in the notes section of the budget. Project faculty (non students) are compensated a summer ninth up to a cap of $13,500 per team member based on 2-4 collaborators. Librarians/curators/staff may be compensated up to $13,500 as additional pay pending approval of a higher administrative authority and/or human resources. (Summer ninth calculation up to the cap will be later elected as compensation or research funds). (No more than $54,000 for this line item). 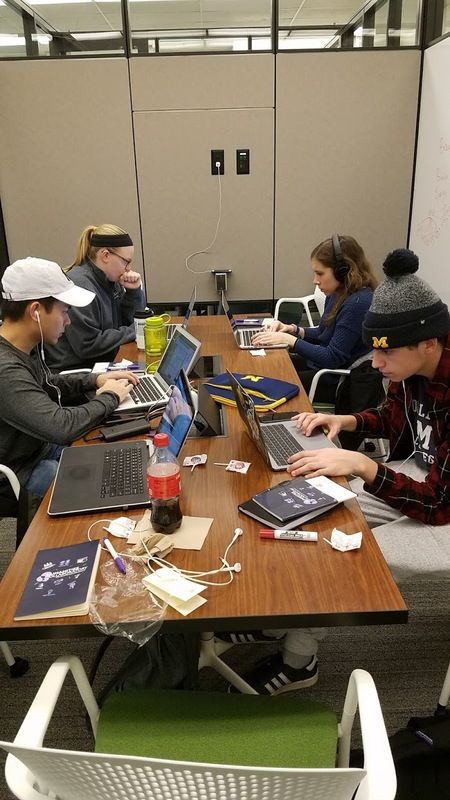 Research expenses (team travel, materials, bringing specialists to campus, consultants, technical support if not otherwise provided through other UM resources, etc. 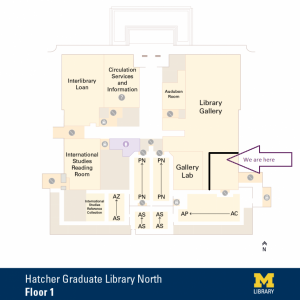 ; no equipment can be purchased with project funds, it is anticipated Hatcher Library or the Collaboratory will have equipment or technical resources available as needed) (usually $2-$20,000 depending on travel).